I started blogging on The Attic on July 7, 2011. In fact, my two year blogoversary is on Sunday! Talking about something I absolutely love! I've been an avid reader for as long as I can remember. I love sharing my opinion of novels and hearing what others think. And I've also discovered that when I write reviews, I remember more of what I've read. I review YA. I read pretty much everything. A lot of that, however, is paranormal, sci-fi, dystopia, some fantasy and a good dose of ghost stories. I'm not a big fan of contemporary but I do love John Green's books. DFTBA! This is always the hardest question to answer... I'm a huge Maggie Stiefvater fan, so I'd probably go with The Wolves of Mercy Falls trilogy. I've read them and listened to the audio books several times. I also have an slightly unhealthy obsession with Sam. (Actually this a pretty concrete answer. I don't know why I was hesitant at the beginning.) I also love Harry Potter, Gemma Doyle, The Mortal Instruments, and Across the Universe to name a few others. So many things! Just talking to other bloggers during Twitter parties for read-a-thons, being able to join groups like the Airship Squadron and the Army of Ten, and being chosen several times to be an Ambuzzador on Random Buzzers. I just love that I'm a part of an awesome community of people. I've always been fond of WW2 books, which sounds like an oddly chipper thing to say about such a dour subject. Elizabeth Wein's Code Name Verity is incredible. I love Revolution by Jennifer Donnelly which is, in part, about the French Revolution. On the adult side, Jeff Shaara's books about the Revolutionary War, the Civil War, WW1, and WW2. Revolution is a good book. I forgot about that one! I like Historical fiction. It's crazy, I have already found 6 links above that don't actually link to a Follow Friday... just to their blog I suppose to bring in traffic. Sad. I'm not big on the war topic, so I haven't read many with it as a subject, but I'm glad you love the subject so much! It's awesome to hear other peoples book fancies. I still need to read Code Name Verity! I do not read many books that have to do with war unless they are dystopian but I have heard this one is really good! I haven't read too many books with war in them either. I see a lot of movies with war as a back drop, but for some reason I shy away from books. I really shouldn't. I haven't read too many books with war scenes. Two which come to mind are Gone With The Wind & North and South. I picked The Hunger Games because it made a lasting impression on me. I suppose because I come from a country that's never had a civil war (Australia). I really like to watch the collapse of governments, but less so the formation of the new one! I haven't read any war books, but I'm glad you enjoy them so much!! I haven't read to many war books.I could give you that anwer easily if it was a movie. Haven't read any of those! Nice ones! 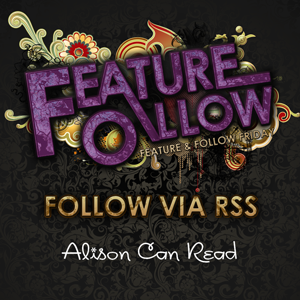 Brand new GFC follower, and brand new book blogger. I heard that book is really good. I need to read it. Hopping through... old follower. I still haven't read Code Name Verity, but I'm going to soon, hopefully. I'm just a little nervous because it seems so intense. I love WWII books, too. Have you read Bomb: The Race to Build - and Steal - the World's Most Dangerous Weapon by Steve Sheinkin. It's MG non-fiction, but it is so so so good. It's won tons of awards, and it deserves them all. I actually chose another Sheinkin book for my Friday Hop answer. I don't read a ton of NF, but I definitely make the time for Sheinkin's books. He's that awesome. Cool features and nice question. Happy Friday Alison. Hmm, I'm trying to think of a book that has a war battle in it. the only one involving the US I'm thinking is The Hunger Games. hopping through! just recently finished reading a book about war so I thought my review of that book would be appropriate to share this week :) Hope you had a great 4th! I haven't read that book! Hopping through Allison, old follower! I've asked Rachel but I thought to ask you too, what's a photobomb? Next week's activity.